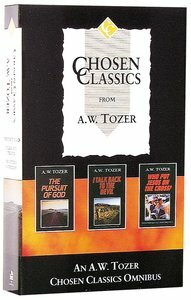 CHOSEN CLASSICS FROM TOZERA W TozerThis value-priced volume includes three Tozer titles - THE PURSUIT OF GOD, ITALK BACK TO THE DEVIL, and WHO PUT JESUS ON THE CROSS? Theseclassics will challenge and inspire you in your relationship with God. 174 pages, fromOMF. About "Chosen Classics From a W Tozer"